Cole Anthony and Nico Mannion, the two top point guards in the Class of 2019, showed out in the Nike Hoop Summit. 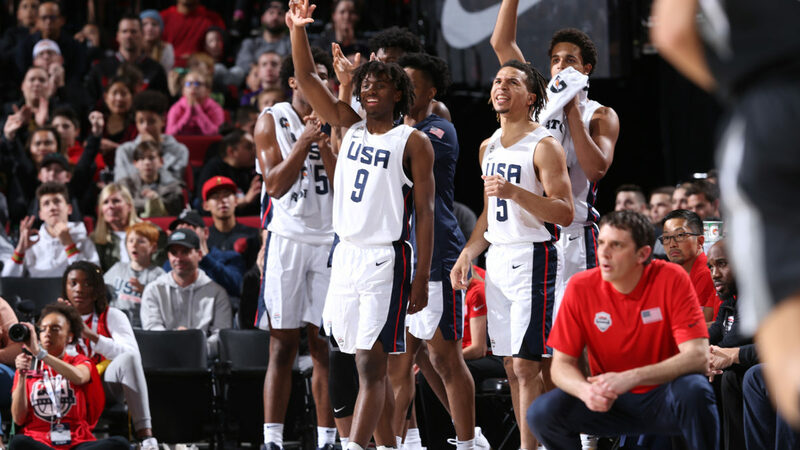 The uncommitted Anthony went for 25 points and 8 rebounds as the USA beat Team World, 93-87, in Portland, Ore. Mannion, who reclassed up to 2019 from 2020 and committed to Arizona, had a game-high 28 points and 5 assists in the loss. Anthony is considering North Carolina, Oregon, Georgetown and Notre Dame and is expected to announced sometime this month. Mannion, who has played for Italy in world competition, was also highly impressive in front of the 165 credentialed NBA personnel, controlling the tempo, dishing and getting his shot. “James Wiseman, Nico Mannion and Precious Achiuwa were the three best players in the floor,” one NBA executive said. The 7-1 Wiseman, who went for 12 points, 8 rebounds and 6 blocks for Team USA, is committed to play for Penny Hardaway at Memphis. He could be the No. 1 pick in 2020, as I wrote here on Forbes SportsMoney. The 6-9 Achiuwa, a Nigerian native who had 15 points and 11 rebounds the Team World, is considering North Carolina, Kansas and Memphis, among others, and is expected to announce in May. Mannion played last summer with Italy, where his mother Gaia is from. Like Anthony’s father, Greg, who played in the NBA with the Knicks and Blazers, Pace Mannion also played in Italy, where he met Nico’s mother.